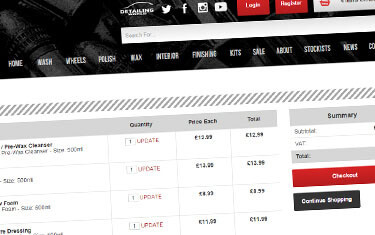 The 50cal team came to us because they needed a stylish, functional ecommerce site for their high-calibre detailing products. The brief called for a cutting-edge website that would look great on all devices and make it easy for customers to complete their purchases. We used our vast experience of ecommerce web design to create a site that meets - and exceeds - these requirements. 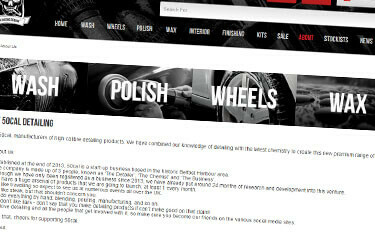 We created www.50caldetailing.co.uk – a responsive ecommerce website that really stands out from the crowd. The sleek black design is perfectly in tune with the company’s image, and the purchasing process is simple and streamlined, with SagePay and PayPal integration. For its high-impact design and for the user experience that it offers, we feel that this website is truly outstanding, and we’re pleased to report that the 50cal team agree! "We are a start-up company in an over-saturated market, and so our ecommerce website needed to be the very best. Choosing Designer Websites was one of the best decisions I ever made – we worked with them remotely from our headquarters in Northern Ireland, discussing 50cal’s online needs via emails and phone calls. This process resulted in a responsive ecommerce website that’s easy to use and very professional-looking (we particularly like the integrated social media and the built-in blog). Our customers have nothing but praise for the website, and our conversion figures are looking great; DW are world-class at what they do, and I wouldn’t hesitate to recommend them to anyone. I look forward to working with Jason, Jenna, and the rest of the team in the future." 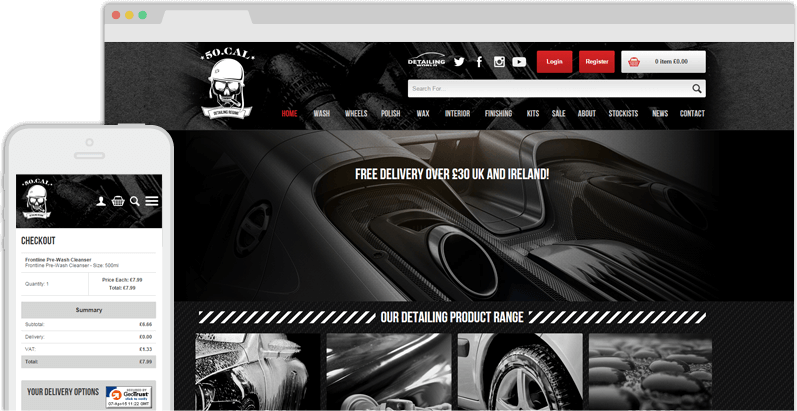 Ecommerce Websites: 50cal Detailing50cal are based in Belfast Harbour, and they specialise in custom-made car detailing products such as polish, wax, and dressing. With only three people on the payroll, they’re a modestly-sized company, but they’re ambitiously aiming to raise the bar for detailing suppliers everywhere – they’ve even got their own lab, where their in-house chemist makes everything they sell. Obviously, a unique enterprise like 50cal needed an equally unique website, one specifically designed to capture the attention of its target audience. As we worked on 50calDetailing.co.uk, we knew that it needed to be equal parts style and substance; we wanted to give users the best possible experience, while also reflecting the flawless finish that the company’s products provide. Responsive DesignSince presentation and user interface were such crucial factors for 50cal, it was quickly decided that a responsive, mobile-friendly design was an absolute must. Google, along with a slew of other internet giants, now recommend responsive design as best practice; a fluid layout that responds to different screen sizes is the best way to ensure that all of your users have a good experience with your site, regardless of what device they might be using. With this in mind, we created a simple, striking design for the 50cal website, making sure as we did so that the site would be easy to navigate on tablets, mobile phones, and desktop computers alike. Hassle-Free TransactionsThe shopping basket is the most important part of any ecommerce website – a stylish, eye-catching design is no use if people can’t make purchases. As with any user interface, a good checkout system needs to be fairly simple, and so we aimed to create a payment process with as few steps as possible for the user. 50cal customers simply add their desired products to the basket, click on the checkout button, and enter their details on the next page to complete the transaction. This streamlined approach helps to cut down on basket dropout and minimise the amount of time that a user has to spend on the site. Speed is the key to happy customers! 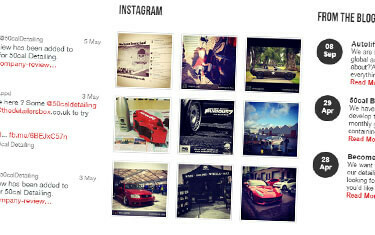 Social Media IntegrationThe 50cal team are extremely active on social media sites like Twitter and Instagram, and they wanted this activity to be visible on the company website. We embedded large, eye-catching feeds on the homepage, which show off 50cal’s latest tweets and photographs; we also placed social media buttons in the site’s header and footer. This will help to drive more followers to the company’s social accounts, and it shows potential customers that 50cal are a switched-on, plugged-in business who will be easy to communicate with.